08:30 - just passed under the Verrazano-Narrow Bridge. SOG (speed over ground) about 6 knots. Thought we'd be doing more than that by now. Still pretty foggy. Lots of big ships anchored up ahead. Fingers crossed! 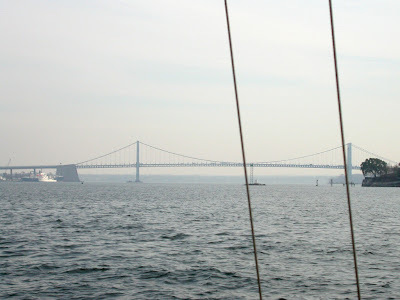 Once you go under the Verrazano-Narrows Bridge, you enter New York's Upper Bay. 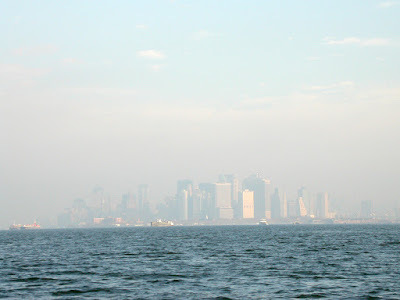 I would call it the lower part of New York Harbor. 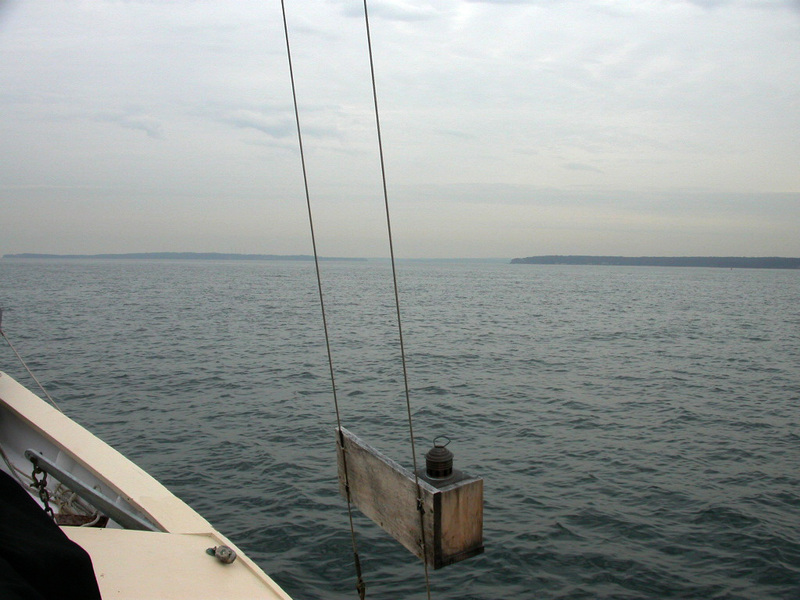 It's much narrower than the vast Lower Bay, just a mile or two wide, with the main channel being about a mile wide. I expected it to look all industrial, with monster ships running up and down the channel. But it looked surprisingly pastoral, with trees in their autumn colors, the occasional white church spire poking above the tree line, and some substantial houses on the shore line. The ship traffic was also lighter and easier to deal with than I feared. 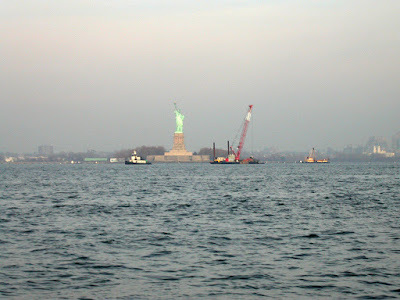 I stayed out of the ship channel, of course, keeping between the red buoys and the Brooklyn shore. A large ship passed by about every 10 minutes. Some were going north, others south, but they moved at a more stately speed in the Upper Bay and I was far enough out of the channel that I could enjoy watching them go by. I was monitoring Channel 13, as recommended. This is the channel used by the big guys to coordinate their movements with each other. There was a lot of efficient-sounding chatter on this channel, back and forth between the captains of the big ships, tugs, barges, ferries, etc. Frankly, I couldn't make head or tails out of it, and I was glad none of them were talking to (or even noticing) me. I just stayed out of every one's way, as best I could. Tug headed down the Narrows, and the New Jersey shore. 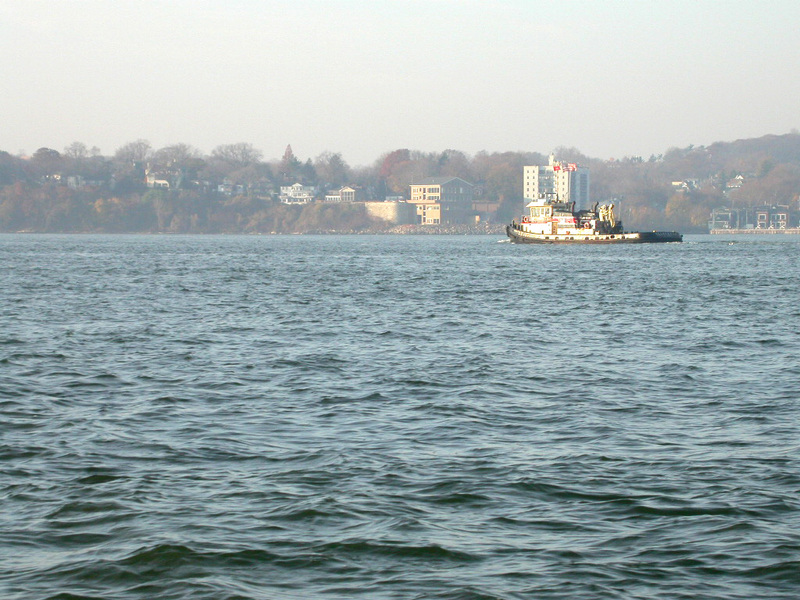 Starting from the southern tip of the Bay Ridge Flats (see chart above), and going north, the main channel serves essentially as an anchorage. There were dozens of large ships anchored there, with smaller boats buzzing around in the water between them. 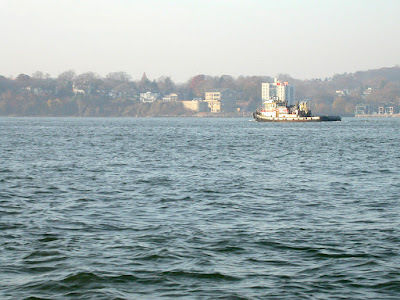 I skirted along the western edge of the Bay Ridge Flats, between these shallows and the busy rows of anchored ships. This kept me out of the main action, but worried enough that I forgot to take any pictures of this fascinating scene. 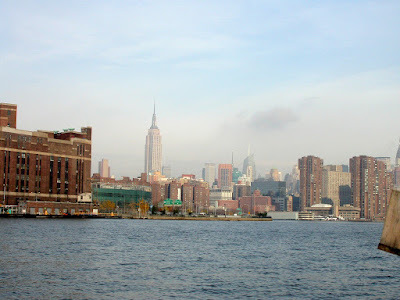 Besides, I was much more interested in the scene to the north, where the fog had finally lifted off the southern end, at least, of Manhattan Island. 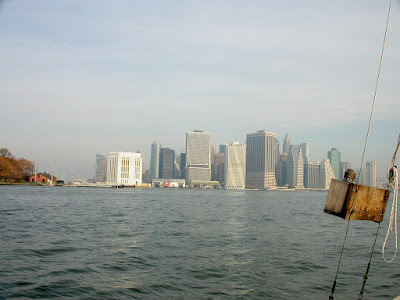 Manhattan Island, with yet another ferry speeding directly for me! 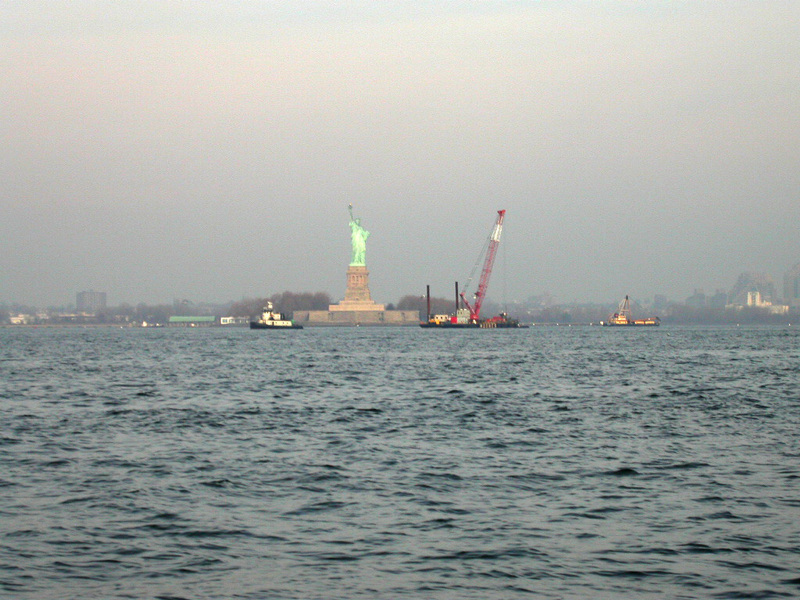 A short while later, we cruised past Lady Liberty, looking surprisingly small and vulnerable in the morning light. That accounts, maybe, for the 150 yard permanent security zone around her. Don't even think of getting too close to this girl. 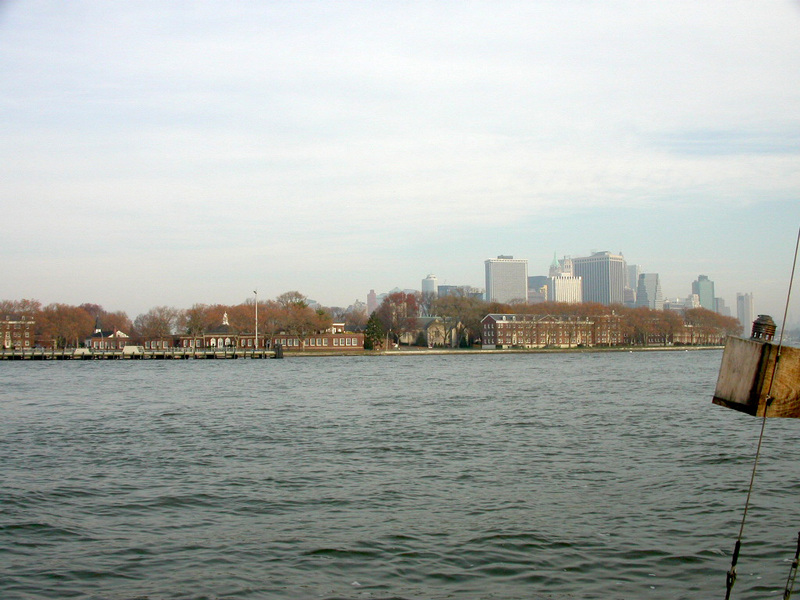 When you reach the southern end of Governor's Island, you have a choice of either the main channel to the west, or the Buttermilk Channel to the east. I chose the Buttermilk because it took me out of the main traffic and seemed a bit more protected from the northerly breeze. Governor's Island got it's name when New York was a British colony. 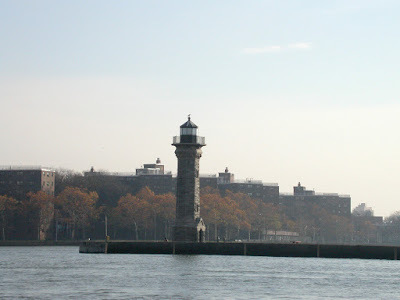 The island, being just a mile south of Manhattan, and close to the anchorage for the British fleet, was reserved for the use of the royal governor. Even back then it was location, location, location. The island was occupied by the American Continental Army at the beginning of the Revolutionary War. General Israel Putnam fortified the island with earthworks and 40 cannon. 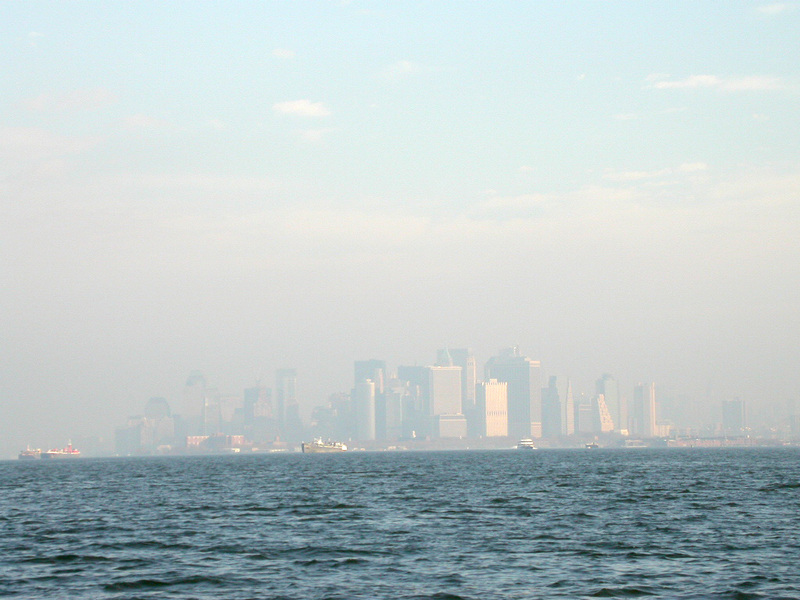 The island played an important part in the Battle of Long Island, keeping the British Fleet out of the East River, covering General Washington's retreat across that river, from Brooklyn to Manhattan. The British soon recaptured Governor's Island and held it until the end of the war. Coming out of the Buttermilk Channel, we finally got our first good view of Manhattan. It was close to 9:30 and the fog had finally burned off. In fact, it was turning into a gorgeous day. Even better, we were finally entering the lower end of the East River. But it was getting late, we were still only doing 6 knots, and Hell Gate was a bit more than 6 nm away. I was starting to get seriously worried. But the view was terrific! As we entered the East River, proper, the current began to speed up. 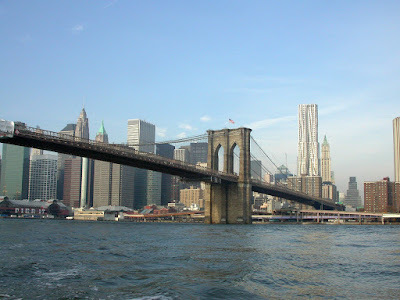 By the time we cruised under the fabulous Brooklyn Bridge, we were doing 6.5 knots. Better, but it would still be close to 10:30 before we hit Hell Gate. That was cutting it a bit too close, even for me. 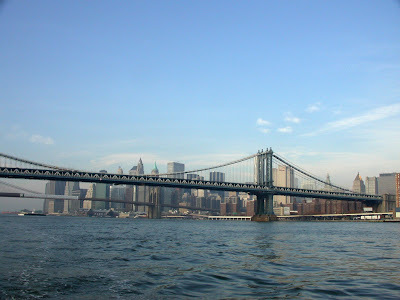 The lower reaches of the East River are actually spanned by 3 historic suspension bridges. If you are ever in New York City, you can impress the locals by remembering their names. Just remember 'BMW': Brooklyn, Manhattan, and (the hard one) Williamsburg. Each, in turn, was the longest suspension bridge in the world, when they opened. I always find it amazing that the Brooklyn bridge opened in 1867 -- when the only traffic were horse carts, pedestrians, and streetcars. I was glad not to be stuck in the morning rush-hour traffic that clogged the bridge as I sailed underneath it. Once past the Williamsburg, we had a great view of Midtown and the Empire State Building. 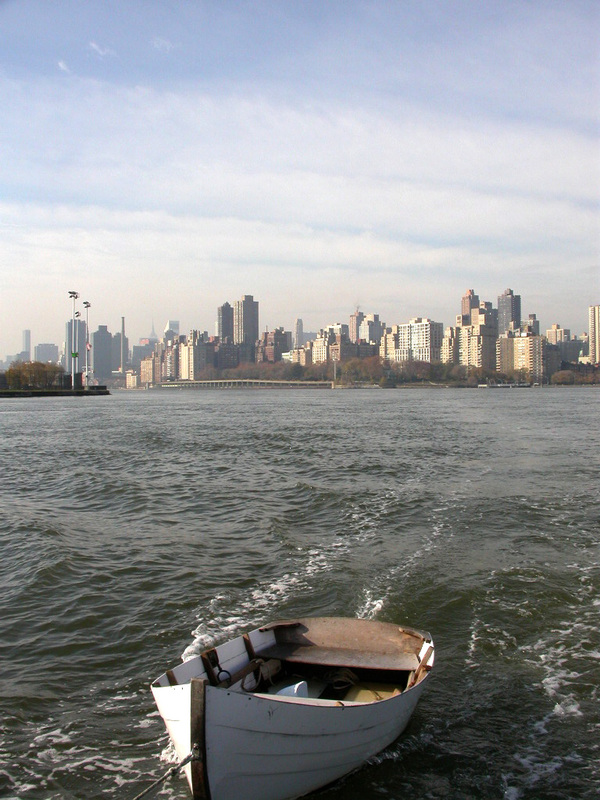 We were also approaching the southern end of the almost 2 mile long Roosevelt Island. 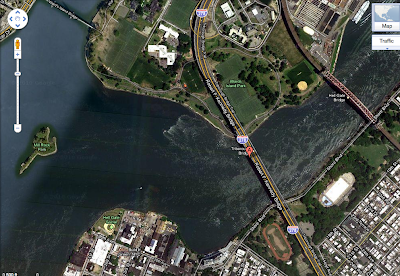 Since Roosevelt Island sat right in the middle of the East River, and squeezed it into two narrow channels, I expected the current to pick up appreciably. Roosevelt Island did not disappoint. I took the recommended western channel and we were soon doing 7 or 7.5 knots. That was more like it! We'd made such good time, in fact, that it was just 10:15 when we cruised past the Blackwell Island Lighthouse that marked the end of Roosevelt Island... and the beginning of Hell Gate. We still had the current with us and, assuming we survived the standing waves, whirlpools, and sea serpents of Hell Gate, we were clearly going to make it! Happily for me -- unhappily for the sake of drama -- there weren't any standing waves, whirlpools, or sea serpents. In fact, infamous Hell Gate was more or less a millpond. Was one swirly bit that I took a picture of (see below), but that was pretty much it. 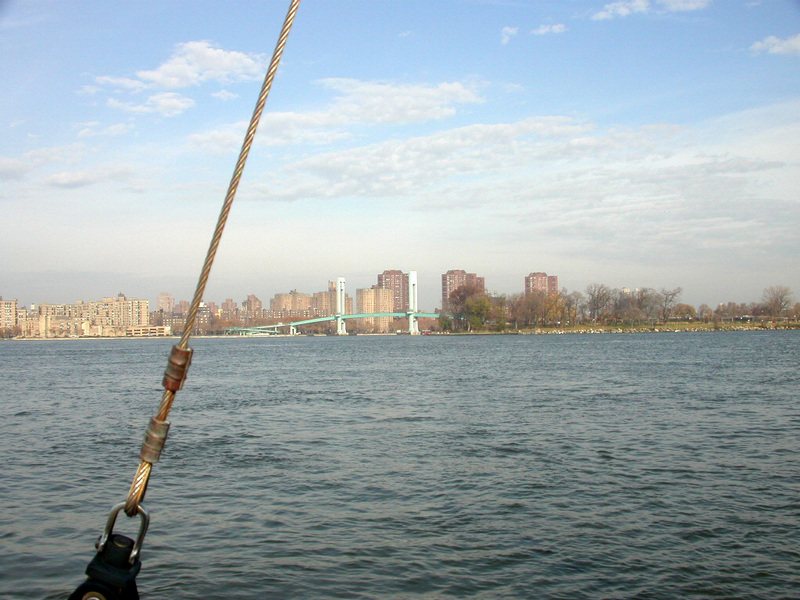 By sheer luck, we'd hit Hell Gate about a half-hour before slack water -- probably about as calm as Hell Gate gets. I was NOT complaining. In fact, I whooped for joy. Hell Gate was the last major obstacle between me and home, and I was now past it. All the tension of the last few days seemed to fall away, to be replaced by a huge sense of relief. I'd made it! I turned around and took a celebratory photo of Cabin Boy, who'd also braved and survived Hell Gate. He looked suitably proud. As I snapped this photo, my joy was clipped short by the loud toot of a ship's horn. Spinning around, I could see the bow of a rather large ship approaching from the north. Dang! The ship was about halfway between the two bridges in the photo below and moving fast. I was between Mill Rock Island (the island on the left of the photo), and the RFK Bridge -- on the wrong side of the channel! My hand twitched on the tiller, momentarily heading us for the right side of the channel, but then common sense took command. There was no way I was going to cut across the bow of that ship. At the speed he was going, he would be under the RFK Bridge and making his turn around the bend into Hell Gate in 30 seconds or less. Turning for the right side of the channel would put us directly in his path. So, I steered even more towards the 'wrong' side of the channel. By sheer luck, I was probably in the safest position possible. To hit me, the ship would have to run up on the shoals of the Hog Back. You can see the shallow water over Hog Back, in the picture below. Instead of endangering me, the last remaining rocks of Hell Gate had actually protected me. Luck was with me still. A minute late, the ship was past me and through Hell Gate, and I was telling myself, in no uncertain terms, "Okay, don't get cocky, dude!" We still had a long way to go. Then I broke out a Blue Moon beer. I deserved it! 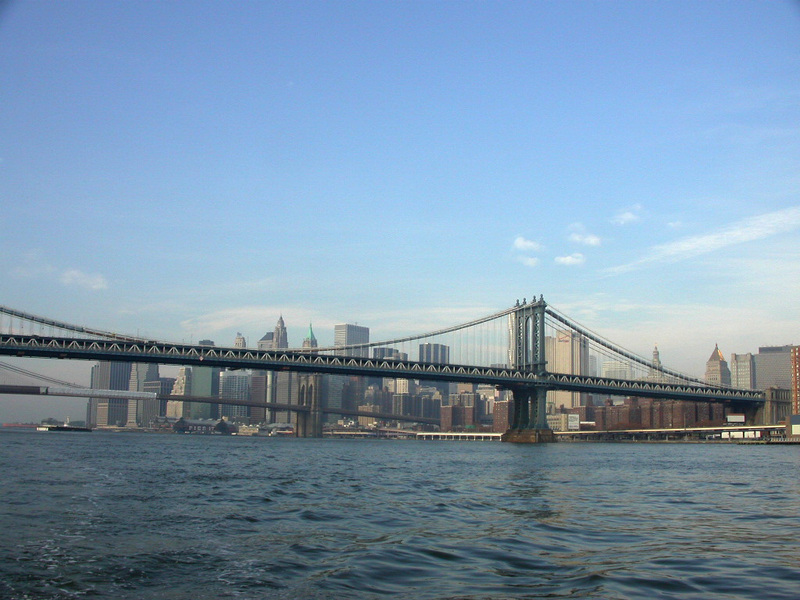 With attention thus enhanced by experience, we got through the rest of the East River. We passed depressing Riker's Island, home to some 14,000 or so unhappy souls, at least one of whom, I'm sure, has a bumper sticker in his cell that says "I'd rather be sailing". And then we passed under the Whitestone Bridge, and finally saw the sight that I'd been anticipating for at least 1000 miles: the Throgs Neck Bridge, and the beginning of Long Island Sound. For months, I'd been urging myself forward, thinking, "If only I can get to beautiful, deep Long Island Sound...", as if no storm or trouble ever ruffled its broad waters. I knew this was not the case, but slowly the Sound had become idealized in my mind as the most perfect sailing water in the world, and I longed to reach it. And for once, King Neptune hadn't prepared an ironic twist for my story. When I sailed under the Throgs Neck Bridge, I wasn't met by a horrific line squall, or an out of control container ship, or even an uncharted rock. In fact, I was met by the placid inland sea of my dreams. And best of all, it was still early in the day -- barely noon. There was still more than 20 nm between me and home, but I thought I might be able to just make it home. And if not, no matter! One of the beautiful aspects of Long Island Sound is that there is a terrific, easy to enter harbor, every 5 miles or so along the coast! If I couldn't make it all the way to Huntington Harbor, I could surely make it to Oyster Bay, which had several blissful anchorages. But two things drove me on: First, the window of good weather that I'd been enjoying since Manasquan (only 2 days ago!) was due to slam shut that very night with a vengeance. I might be stuck in Oyster Bay for several days, which would be okay, but I'd rather not. And second, I still wanted to prove Helena wrong and arrive home before Thanksgiving... even if it was just one day before! So we pressed on at all speed, and even seemed to get a lift from the current, even though we should have had some against us. Perhaps a final gift from King Neptune. We quickly passed City Island -- the historic home of New York City boat builders that I would have loved to see... must get back there this summer! And then Manhasset Bay and Hempstead Bay seemingly flew by. Then there was a long stretch to Oyster Bay. I put Helmo back in command and went below to hot up some soup and make a sandwich. I poked my head up out of the companion way every couple of minutes, but I had the whole Sound to myself. By the time we reached the entrance to Oyster Bay, the day was growing long. It was late November and the day's were short. I hesitated for a moment, thinking, "should I press my luck?" But only for a moment. These were my home waters. I'd sailed into Huntington Harbor many times in the dark. I had the one necessary ingrediant for completing my sail, even in the dark: local knowledge! I urged my trusty Yamaha up to full speed -- surely this was the time for the final push. And as we left Oyster Bay behind, I called Helena. "I'm going to make it home tonight," I said. "Really?" she said -- I had kept her expectations low, just in case. "When? It's getting dark, isn't it?" And oddly enough, I didn't want that last hour to end. As we cruised down the coast of Lloyd Neck, our wake a wide V behind us in the dying light, it was hard to accept the fact that my once-in-a-lifetime cruise was coming to an end. We'd gone through a lot, the three of us -- me, the Blue Moon, and good old Cabin Boy. It certainly had been a Big Adventure. But then we were headed down Huntington Bay behind a fishing boat, passing the big red #8 buoy that had marked the turning point of so many races, and in towards the historic old lighthouse that marked the entrance to Huntington Harbor, where William Atkin had had his first boat shop, back in the day. As I slowly cruised down the narrow harbor, I spotted a little black car on the harbor road, with Helena waving beside it. She'd come down as far as she could to get a first look at us. Then, a little while later, as I slowly backed the Blue Moon into her winter slip for the first time, Helena was on the dock to take my line. I stepped off the boat and kissed her. "I told you we'd make it before Thanksgiving," I said. Her eyes sparkled. "Happy birthday, darling." In all the rush and worry, I'd forgotten. It was my birthday. And a nice birthday present it was, too. >>> Next Project: Building the William Atkin skiff "Vintage"
Thanks for a fantastic voyage. Thanks, John. It has been a hell of a good yarn! You should be proud of yourself AND your boats. By the way, thanks for such a great story. I will miss your writing and adventures. I hope you come back this spring to tell us about your adventures in LIS. Thanks for the great ending! Funny thing, the following. I grew up in NYC, and lived there for many years. Not being a boater, I obviously never got to see the place from your view point. Fascinating. Thank you for some interesting views of my "native" city, one which I left so many years ago. BTW late father knew many people in the City Island area, having been a salesman for S. Apple & Co., a uniform house, which I suspect is also long gone nowadays. An old friend of his, who I suspect is also long gone, was Captain of the paid crew on the Columbia, of America's Cup Fame. John, many thanks for letting us join you on your adventure!! I wish you and your family all the best. Thanks John,What a great story, but it sounds like perhaps its just the begining of a better story. Great John. I'll bet with all this snow you wish you were sailing somewhere where you did not have to hold a shovel. Great adventure. Can't wait for your book. You may have more talent as a writer than a sailor. Lots of luck in your future endeavors. Thanks for all the great comments. I really appreciate it. I'm not going anywhere, though... I've got to get cracking on my big winter project: building the William Atkin skiff called "Vintage". Cabin Boy is too small for two people and next summer, I plan to have company when I sail! Thank you so much for your inspiring narrative. I would love to be able to undertake such a trip, but don't have the natural advantages of the coast you live on. I think your judgement at the end was spot on - navigation in the dark can become, very quickly, confusing and panicky. Hell Gate was a piece of cake because you were well prepared and made the right call. I enjoyed following your blog as you built Cabin Boy and as you sailed Blue Moon. I am looking forward to reading your blog as you build your next boat. All the comments so far I second and would add also that your narrative writing skills make for fine, interesting, and easy reading. Having redone a 1947 Hickley Sou'wester we sail around the St. Augustine area of the Atlantic, and know its' pleasures. However, I end with your last article with nothing but ecitement and a sense of the calm that befalls all true sailors as a journey comes to an end! Wishing for more of the sea, while confined inland, I wish you "Fair Winds" on your winter build. Brilliant reading, all of it, from beginning Cabin Boy to your reaching home. I've read the lot over the weekend and this Monday evening. There aren't many web-sites that'd hold my attention that long, if it was a book it'd be one that I couldn't put down. I really enjoyed it and felt like I was sailing with you. Congratulations, John. A great story. Please keep the details of your forthcoming boat building efforts coming the same way. John, I am so glad I met you and was able to follow your wonderful adventure. Your determination and perseverance are an inspiration. Can't wait to follow the construction of your new skiff. Thanks for a great story, John. If you'd like to read another great story of almost the same journey, but north to south and in 1940 or so; get "Princess" by Joe Richards. I first read it (serialized) in Rudder Magazine in the early 1950's and have since read it in the subsequently published hardback at least twice again. If you can't find it easily, I believe I have two copies, one of which I'd be happy to send you but it's in my New York house which I won't return to until April. Having found your blog yesterday from your post on WB forum about making blocks, I have read it straight through. Thank you so much for keeping up with it. It has been a great read. Your arrival and Helena's welcome nearly brought tears to my eyes. I hope you consider turning your story into a book. Mountzionryan: I am working on a book, but its a lot of work. Maybe in time for Christmas 2011? We'll see. Anyway, thanks for your kind words and encouragement. Glad you enjoyed it. Hi John I started with the build of cabin boy some weeks ago, that's was just going to be that as looking at home build projects and wondering if it something I may take on in the future. Looked at plenty of blogs and yours came up linking from another. But I got drawn in, the story how told made you want to see how this huge trip turned out. So hats off to you for keeping me reading. I'll probably keep going with it now though not so avidly like I have done!